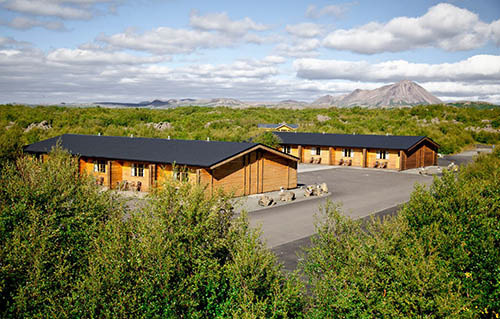 The family-run Vogafjos Guesthouse is set in a unique natural environment on the eastern shore of Lake Myvatn. It offers rooms with a patio and free Wi-Fi. All rooms at Guesthouse Vogafjos have a private bathroom with a shower and toilet. A traditional icelandic breakfast is served everyday in the restaurant, 3 minutes walk from the guesthouse. Lunch and dinner menu is based on local produce, such as smoked lamb, slow-cooked lambshanks, trout, homemade cheese and geyser bread. Guests can relax in the geothermal waters of the 5000m² Myvatn Nature Baths, available nearby at an additional cost. The guesthouse also has a farm with animals such as cows, sheep and horses. The village centre of Reykjahlid is located 2 km from the guesthouse. Krossdalur Golf Course is a 5-minute drive away. This property is also rated for the best value in Vogar! Guests are getting more for their money when compared to other properties in this city. Check out our webpage for further information.